I found these strange eggs on the under surface of Oleander (Nerium oleander) leaf next to my house. 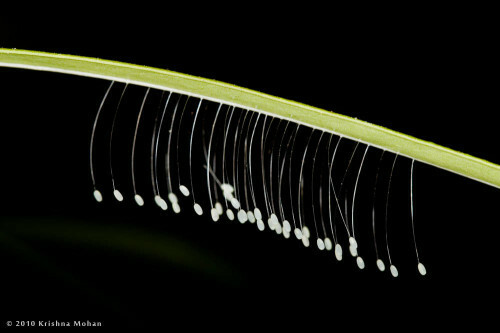 Each egg was attached to the top of a hair-like filament. I had not seen such an egg laying on filamentous structure and on searching for info I found that it was from Lacewing (Chrysopidae). I used Canon EF 100mm f/2.8L Macro IS USM on Canon EOS 5D mark II illuminated using Rayflash on Canon Speedlite 580EX II flash. Each adult female may deposit more than 200 eggs. For best results, habitats should be provided that encourage the adults to remain and reproduce in the release area. Nectar, pollen, and honeydew stimulate their reproductive process. If these food sources are not available, adults may disperse. 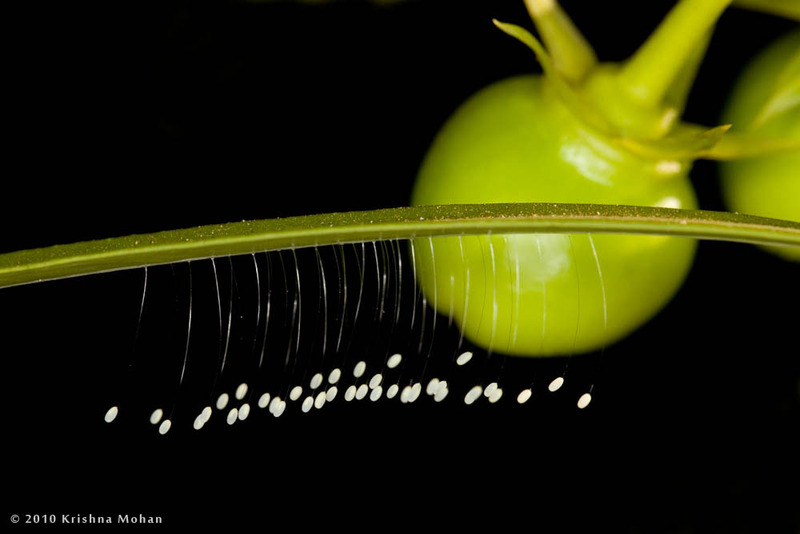 Lacewing larvae feed on many different pest insects. In general, they attack the eggs and the immature stages of most soft-bodied pests such as: aphids, thrips, spider mites, sweet potato & greenhouse whitefly, mealybugs, leafhoppers, and the eggs and caterpillars of most moths. Adult green lacewings are pale green, about 12-20 mm long, with long antennae and bright, golden eyes. They have large, transparent, pale green wings and a delicate body. Adults are active fliers, particularly during the evening and night and have a characteristic, fluttering flight. EXIF info - Aperture : ƒ/10 | Camera : Canon EOS 5D Mark II | Taken : 7 February, 2010 | Flash fired : yes | Focal length : 100mm | ISO : 200 | Location : 13° 4′ 1.7997600119994″ N 74° 59′ 44.314800313234″ E | Shutter speed : 1/125s | Images and content Copyright © Krishna Mohan. Please contact me to purchase prints or for image publication license. Great photos! I had no idea lacewings strung their larvae up. But then again, I don’t know if I even know what a lacewing looks like, so it’s time to consult Google. A great find , it is difficult to find them in first place. and the best photography to go along..
Dear Ashton, Thank you for the nice compliments, and thanks for linking me on your website. Hope I will live up to your expectation. Keep visiting.